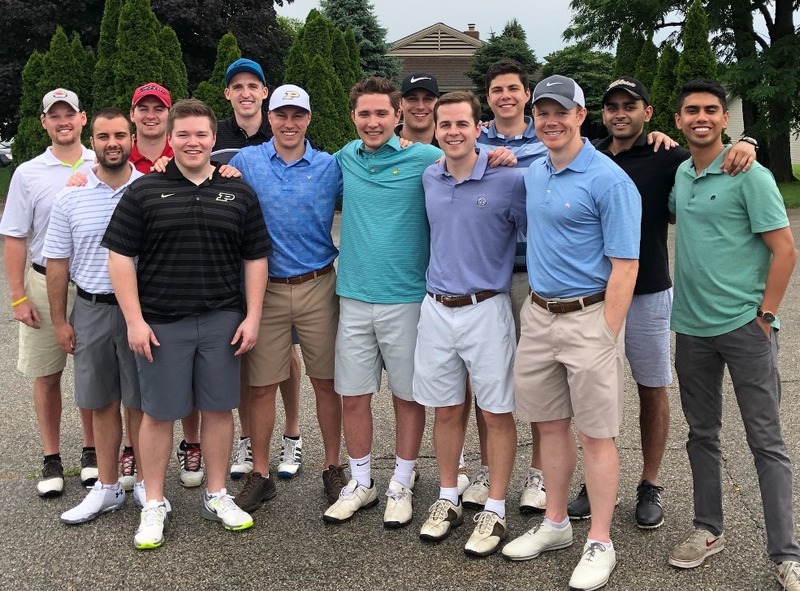 While everyone around us seemed to get rained on, the Delta Delta brothers on the golf course stayed dry and had a great day of golf and brotherhood. Class of ’80 Champions: L-R: R.L. Berry, Jim MacDonald, Mike Spooner and Bob Marks. Three classes took advantage of the Sig outing to get their pledge brothers together for mini reunions. These included the Class of ’68 celebrating 50 years, the Class of ’83 gathering after 35 years and the Class of ’17 getting everyone together after graduating just a year ago. The Class of ’68 met Friday evening for dinner at McGraw’s; the Class of ’83 met early at the golf course and hung out till all hours Saturday evening; and the Class of ’17 started even earlier and finished late into the evening. It was great seeing these brothers enjoying their time together upon their return to 202 Littleton. 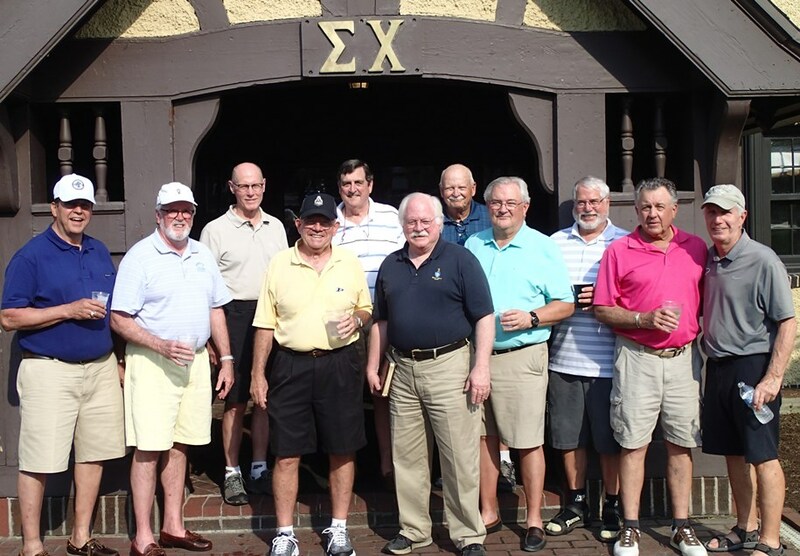 We would encourage every reunion class to use the Alumni Golf Outing as an opportunity to get the boys back together at Delta Delta. 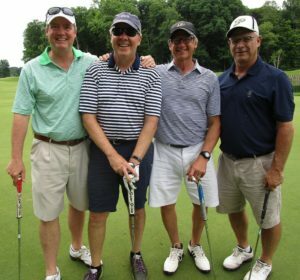 2nd Place: Class of ’83 (L-R) Eric Heeke, Paul Hadley, David Steele and Mike Liesman. 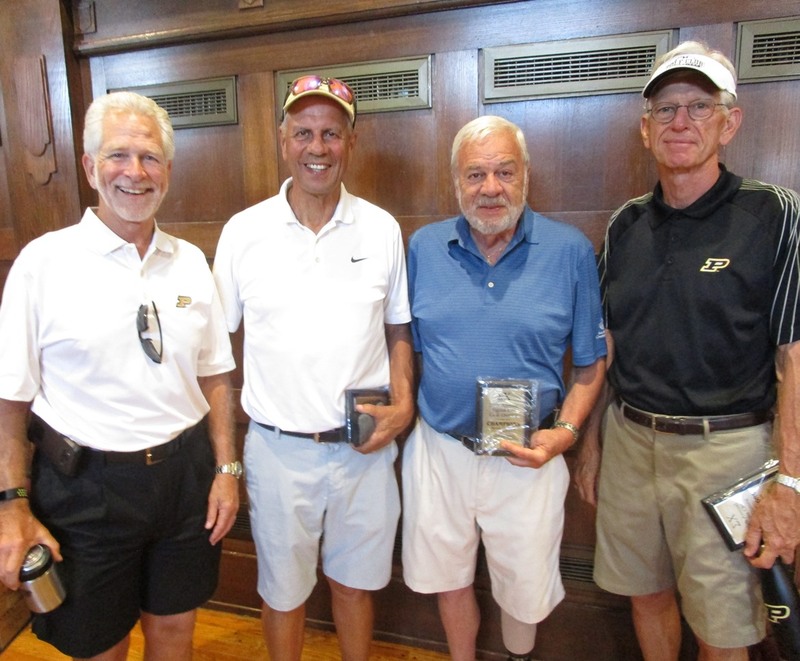 The Purdue Ackerman golf course was in great shape leading to some very good scores. The Class of ’80 took top honors with 14 under par, with foursomes from the Classes of ’83 and ’17 tying for second with 12 under rounds. In a putt off the more senior brothers from the Class of ’83 relegated the younger alumni brothers to 3rd place. The Class of ’71 reclaimed the top spot in the Senior’s category with an impressive round of 13 under. The 55 golfers who took part all enjoyed playing the scenic and fun course. The brothers were treated to a great steak dinner back at the chapter house following the golf. Following the dinner awards and raffle prizes were given out by Guenter Haines ’95. We also wanted to thank Brian Griffiths ’95 for organizing this annual event and Butch Brose ’09 for having the house ready for everyone’s return. 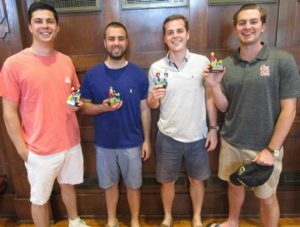 Taking third place Class of ’17 bros (L-R) Peter White, Alex Parisi, Scott Sage, and Mitch Campbell. 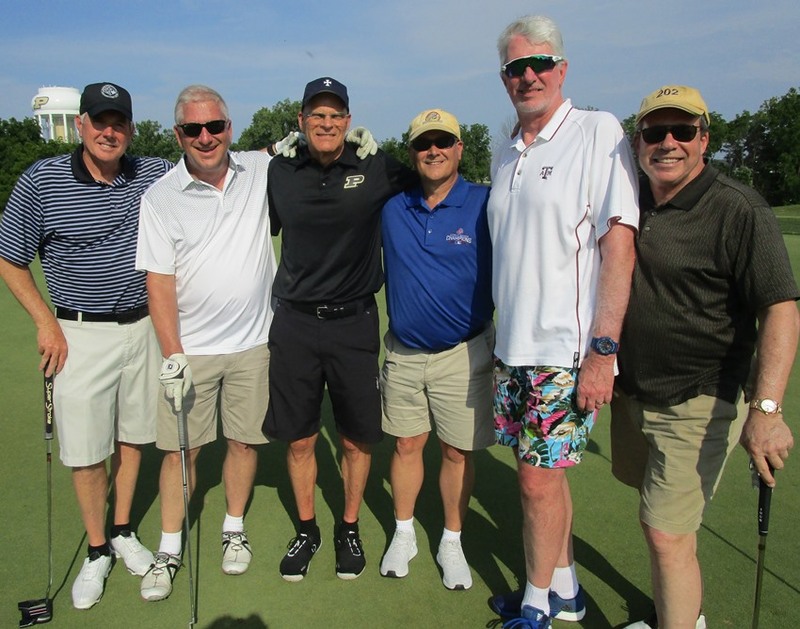 The Delta Delta golf outing is the longest running fraternity event of this kind at Purdue. We just completed our 28th year. Our level of participation has continued to decline over the past few years and for us to keep this a top tier event we need more golfers. Senior Champions again! 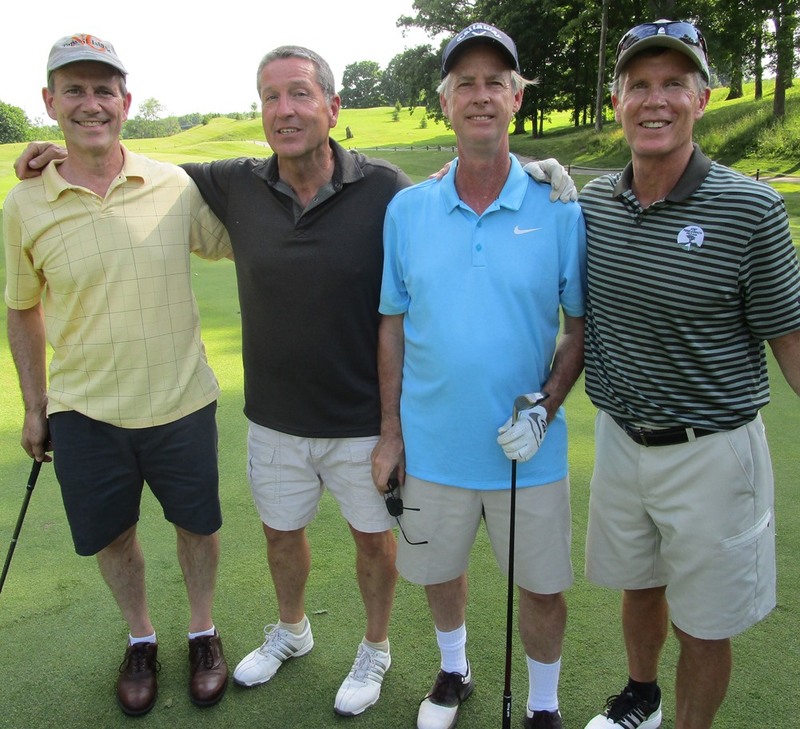 Class of ’71 golfers, Scott McConnell, Larry Nicolet, Dave DeHebreard and Tim Buckley. Not pictured Jim Smith and Tom Ford. MAKE PLANS NOW TO RETURN IN 2019. Put this date on your calendar, June 8th, and start lining up your foursomes now. We encourage a golfer in each class to put together a foursome or two and meet us on the course. Class of ’77: L-R: Tom Schneider, Preston Cobb, Brian Dawson, JB Carson, Jeff Early and John Loop. Not pictured Joel Draper and Phil Steele. 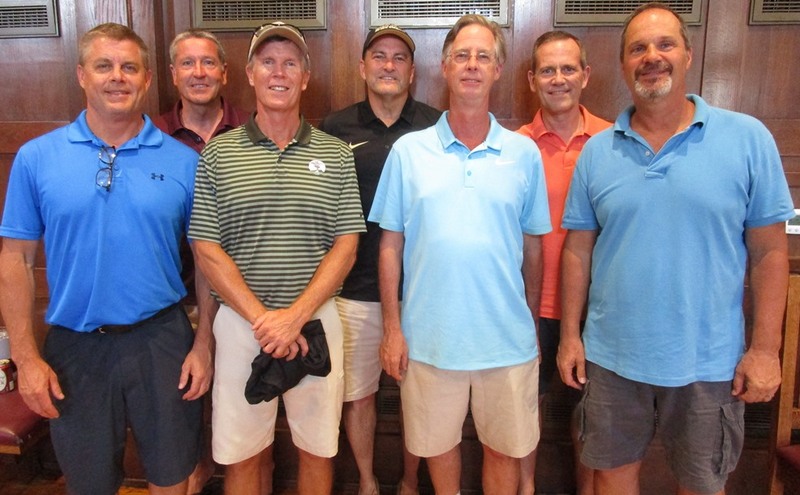 Class of ‘83: L-R: Dave Westerbeck, Paul Hadley, Mike Liesman, Guy Thomas, David Steele, Eric Heeke, and Stew Jepson. The ’77 manley men! Awesome PBs. It was a fun day. I don’t golf but I have a great time riding around with the PBs all day.